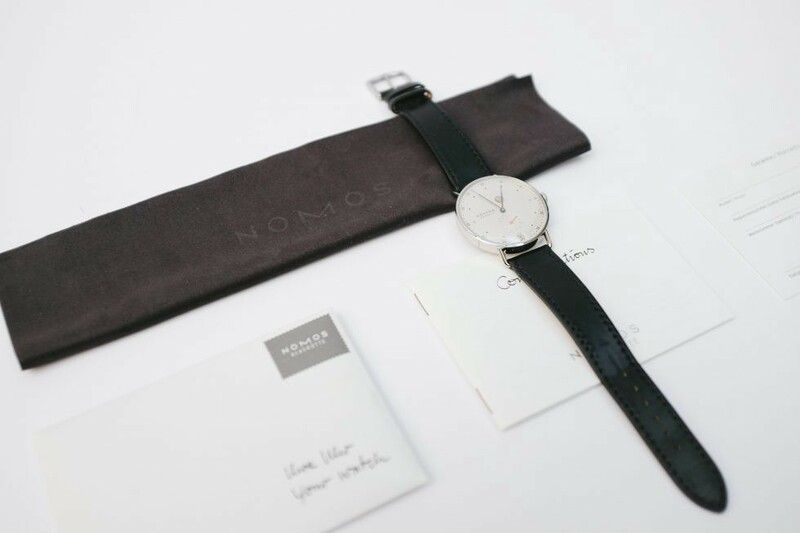 Note — This watch was sent to me by NOMOS, but that will not affect my review. 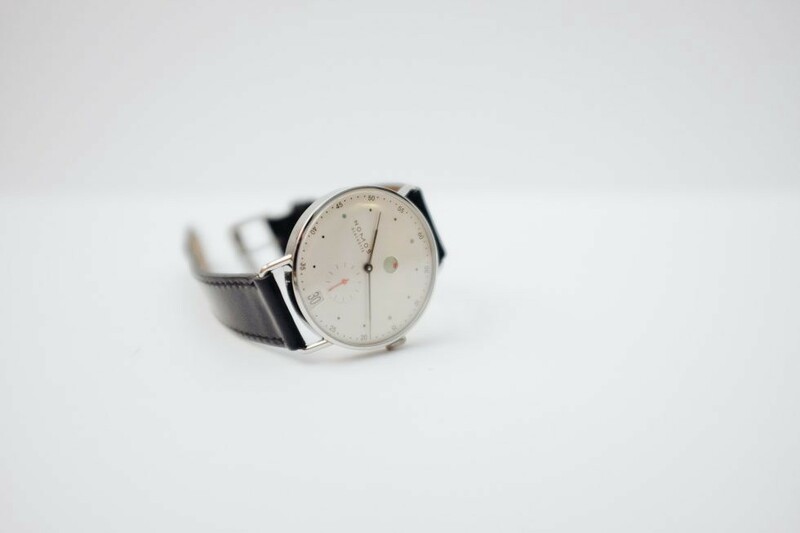 NOMOS reached out to me a few months ago, asking if I had any interest in reviewing their newly released limited Tangente model, which was celebrating a century of Bauhaus design. While that watch looked interesting, I’ve had my eye on the Metro model for the last few years and asked to check that out instead. I was strongly considering it as a purchase back then, so I was more than happy to wear it for a few weeks and get a chance to truly appreciate it. 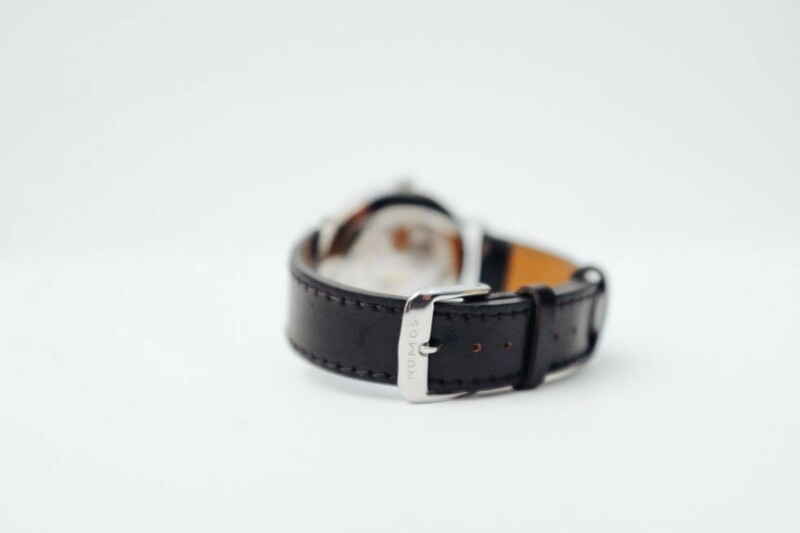 The watch comes in an unassuming wooden box, with a simple button to open it up. 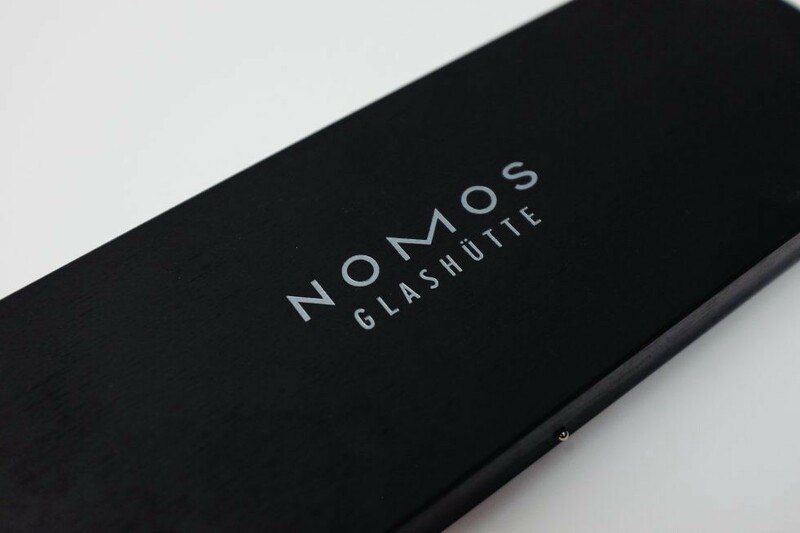 NOMOS has a very minimalistic and modern style overall, and you can see this reflected in the packaging. 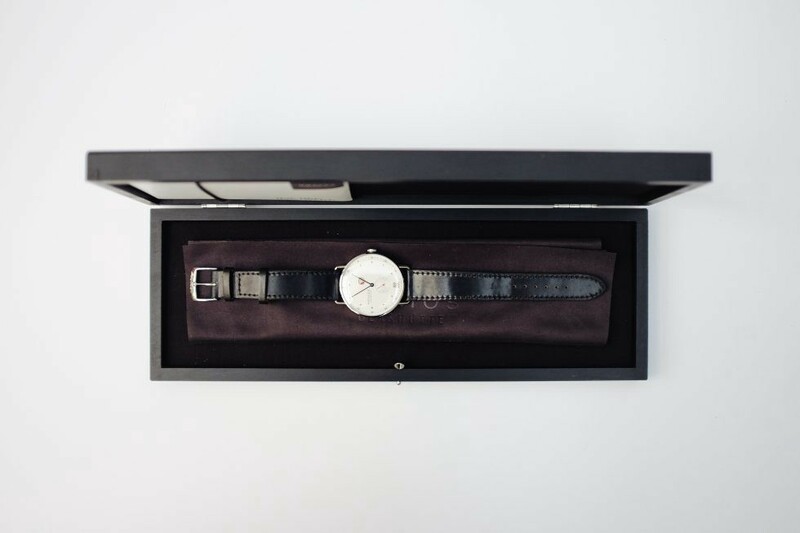 After opening the box, you’re presented with the watch itself, as well as some other things included like a microfiber cloth, and a small envelope. Inside the envelope is what’s typical expected, a small instruction booklet, a thank you, and warranty card. 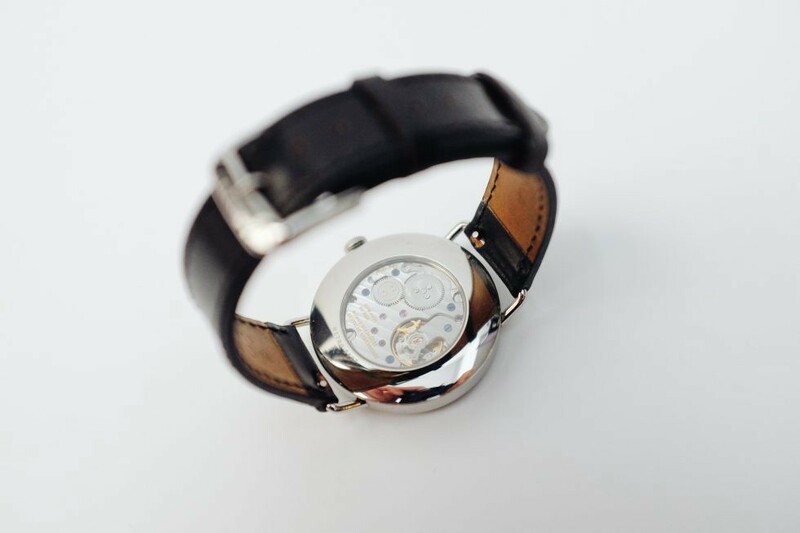 This watch is striking as soon as you see it. The designer Mark Braun wanted to make something that felt different in the sea of luxury watches, and I love the end result. 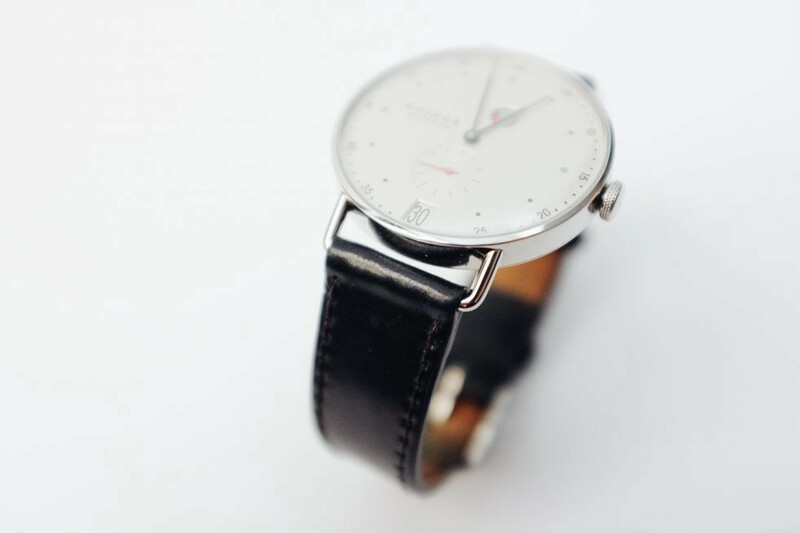 At 37mm wide and 7.65mm thick, this is much smaller than the typical watches I wear on a day to day basis. 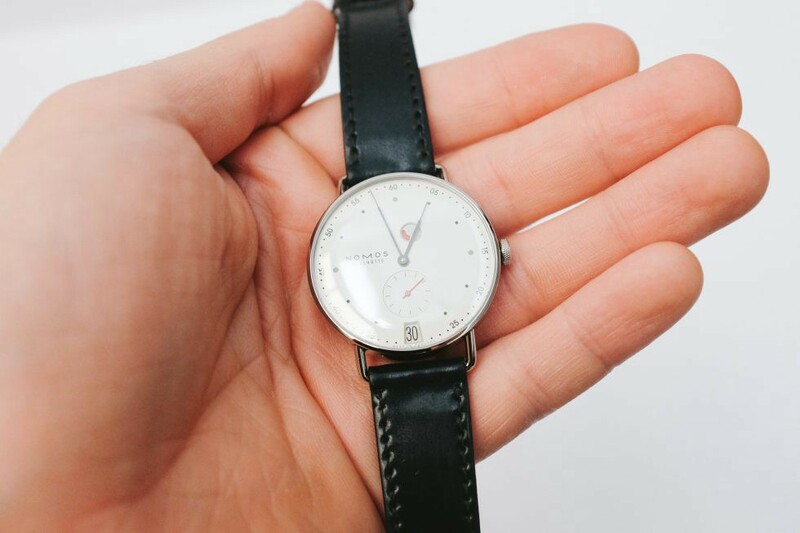 While the width seems small on paper, it doesn’t feel small on the wrist. 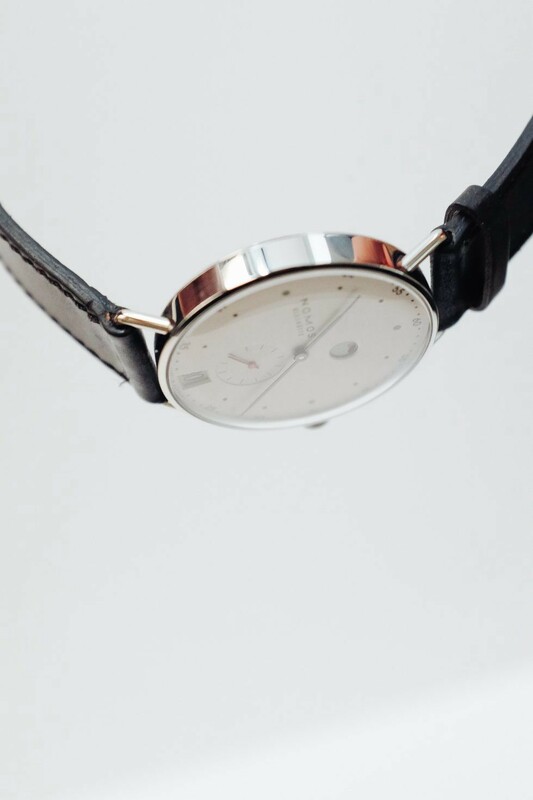 For a dress watch, I think these understated sizes are the way to go, especially when most watches have been trending towards larger sizes in the last little while. Another thing to note about this watch is the movement itself. 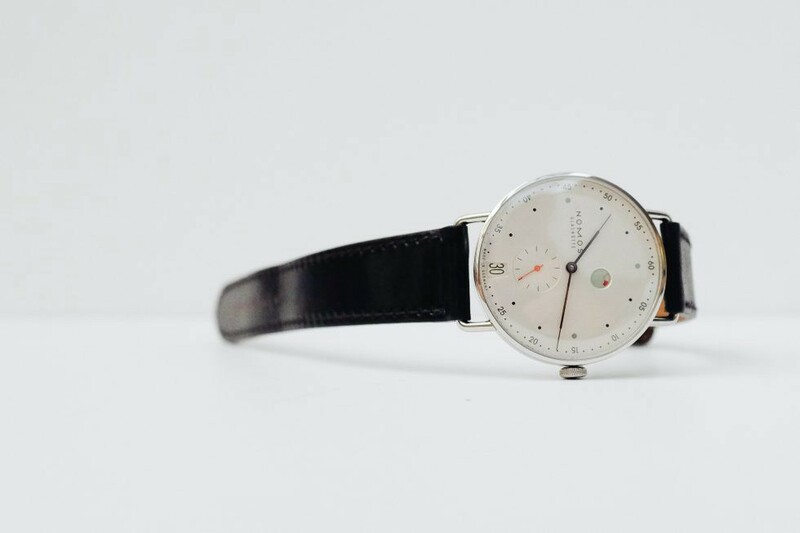 The hand-wound DUW 4401 movement within is designed by NOMOS — something not a lot of watch manufacturers can say these days. 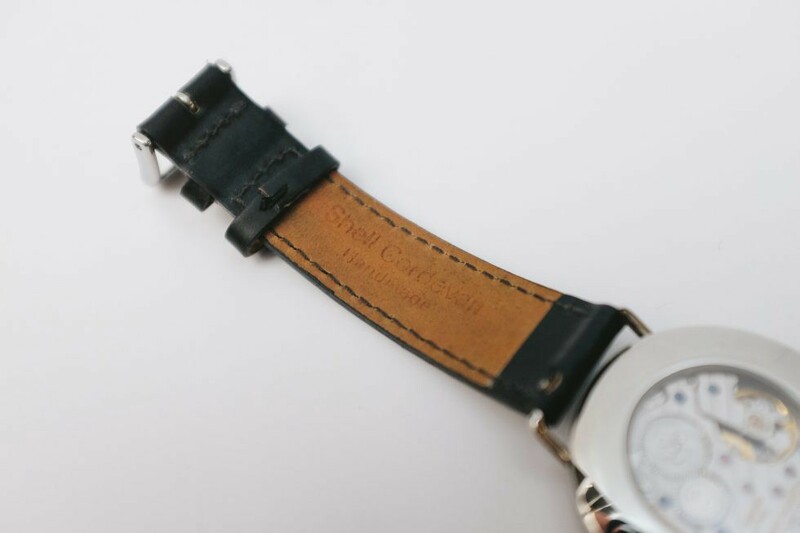 Subtle branding is stamped into the backside of the leather watch band. You’re probably wondering what the blue blotch is on the strap, which I did as well. I reached out NOMOS and was told the following. It’s part of a large stamp, which is a certificate of authenticity of the manufacturer in Chicago. 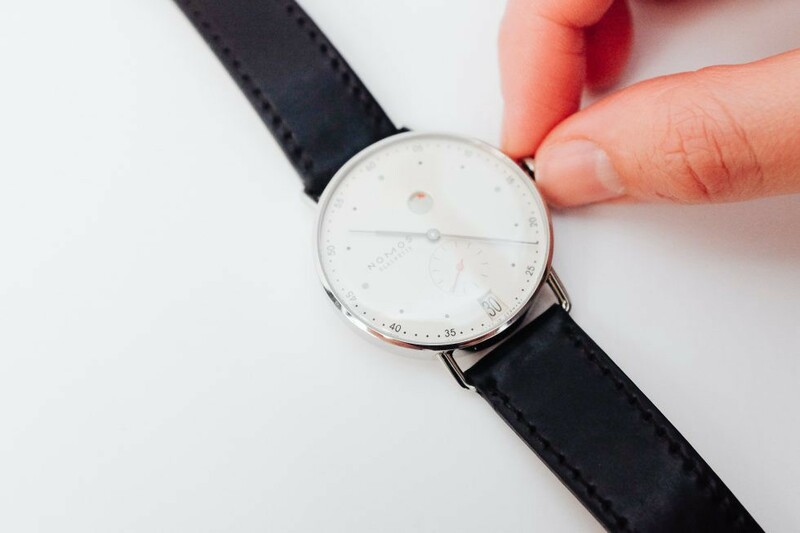 Each large leather part, the so-called shell, gets such a stamp — only afterward, the high-quality leather straps of NOMOS Glashütte are made. It seems like there would be a better way for the manufacturer to handle this process. The mark looks unintentional and immediately stood out to me, especially considering the meticulous details surrounding the rest of the timepiece. 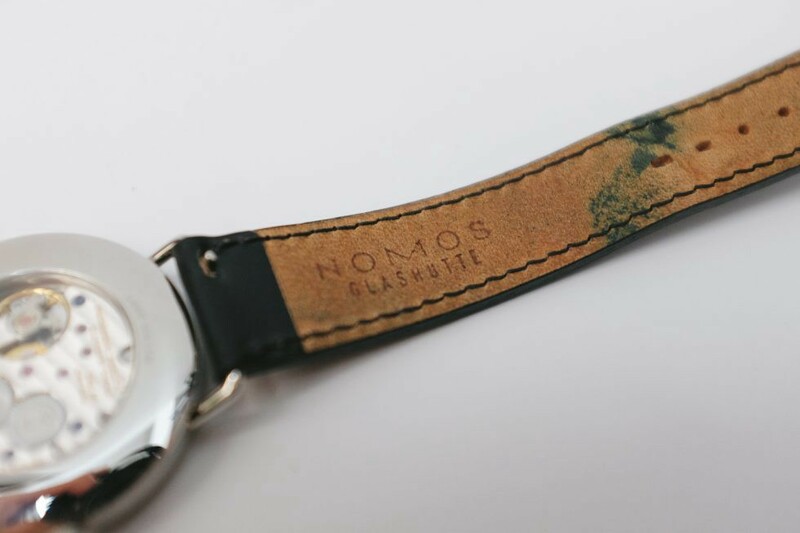 On the other side of the strap, it shows it’s handmade, as well as the material that was used. I can’t understate how lightweight this watch is when it’s on your wrist. My daily drivers are typically on the sporter side of things, so wearing this was actually really refreshing. 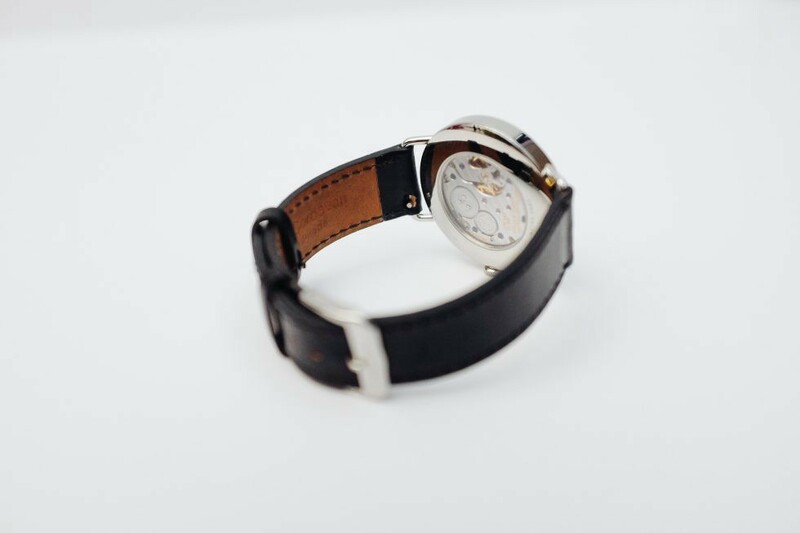 These wire-style lugs are another defining characteristic of the watch. They don’t seem very popular these days, but I think it compliments the rest of the design nicely. 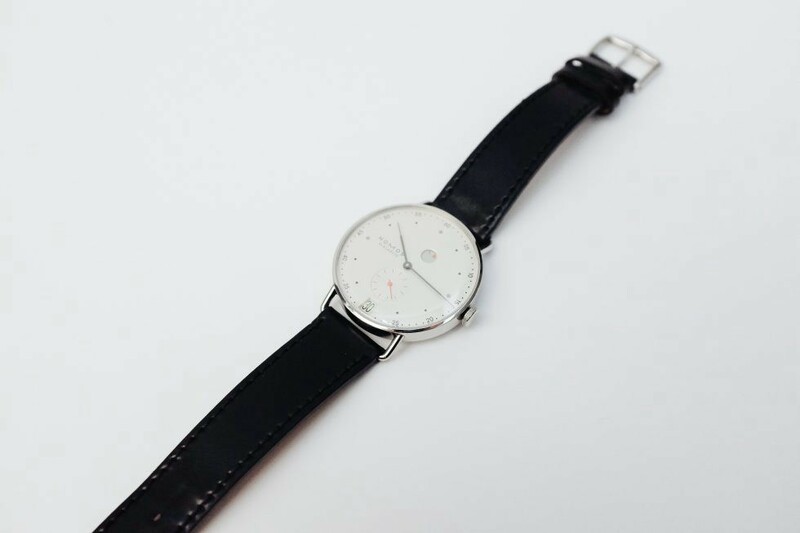 The NOMOS logo is also visible on the watch clasp itself. The display back shows the in-house movement in all its glory. 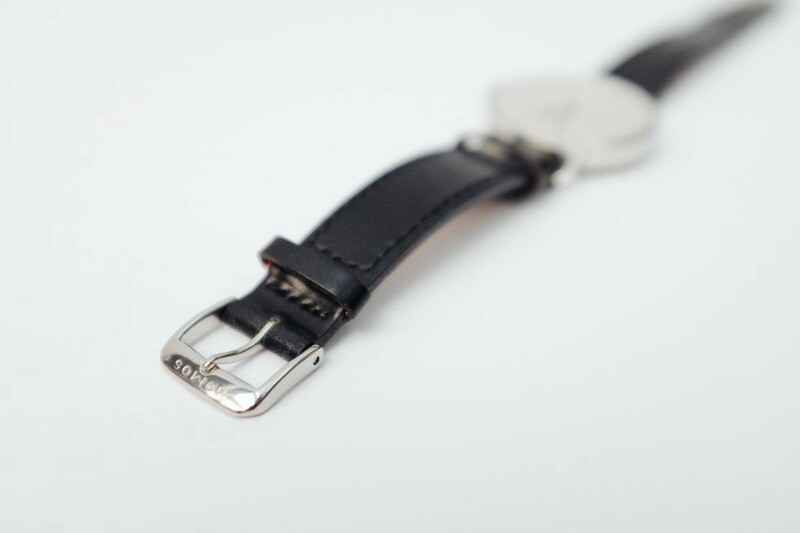 Another nice addition to the watch are these quick-release spring bars for the strap. I can’t tell you how close I’ve come to scratching some other watches while haphazardly trying to remove a strap with a standard spring bar tool. 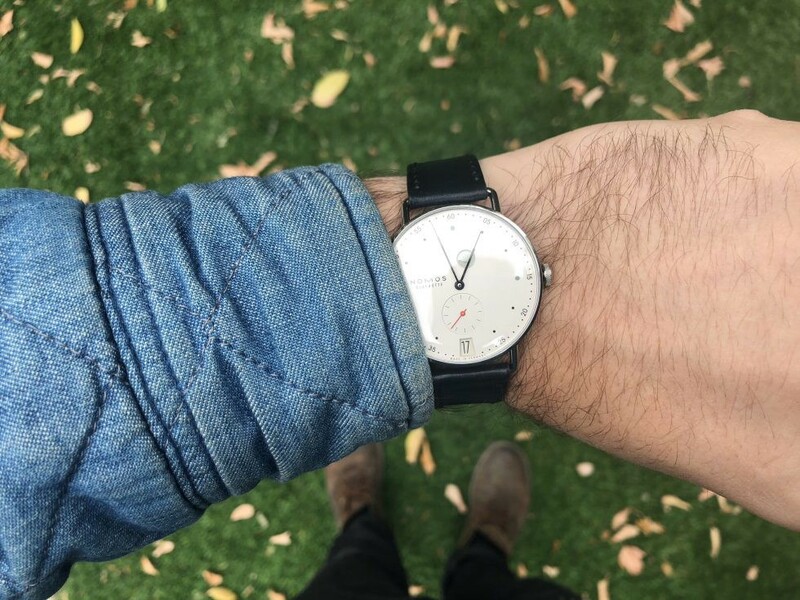 I love the overall profile of this watch. 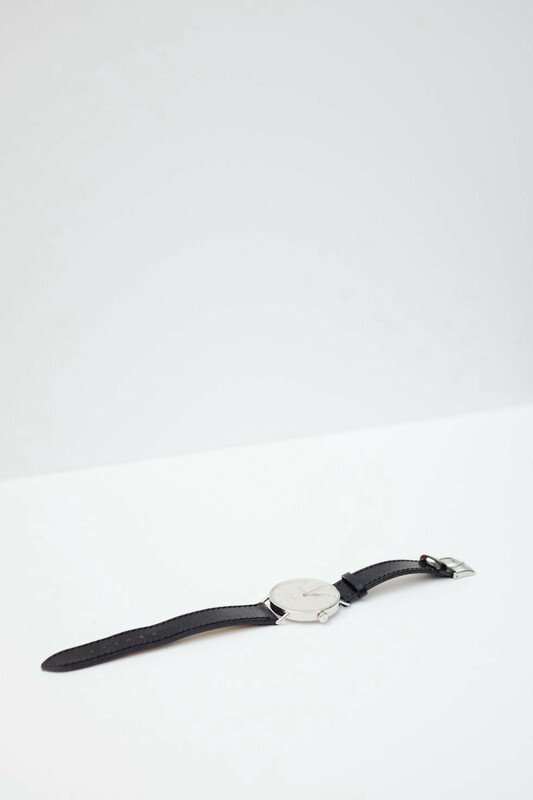 The strap is comfortable enough, but I did have to have it on the tightest setting which was a bit unusual. 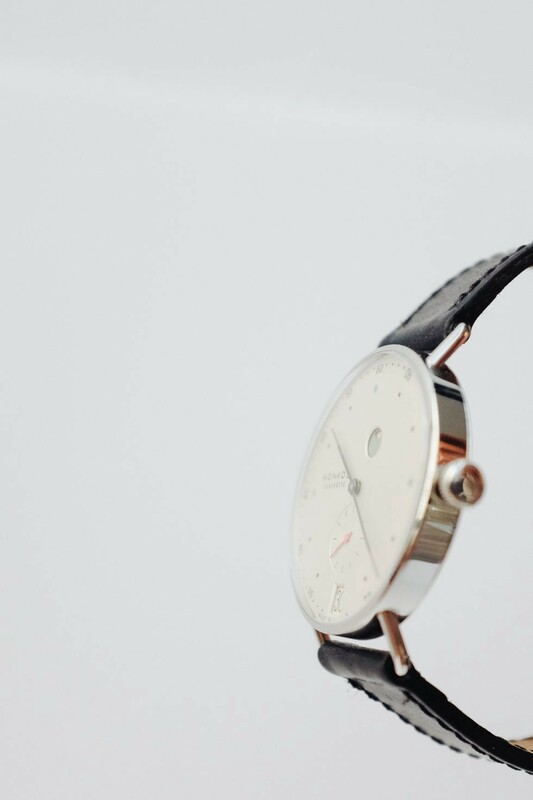 The dial is what puts this watch apart from the competition. Mark Braun designed this with a Bauhaus approach, and the sum of its parts is what makes this thing shine. 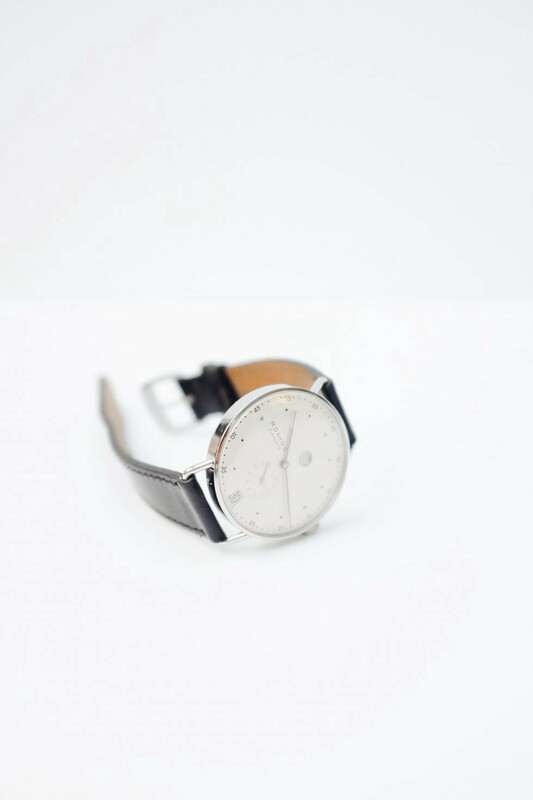 The colors are understated, with a monochromatic dial and hands, contrasted with a mint green and red for the complications. 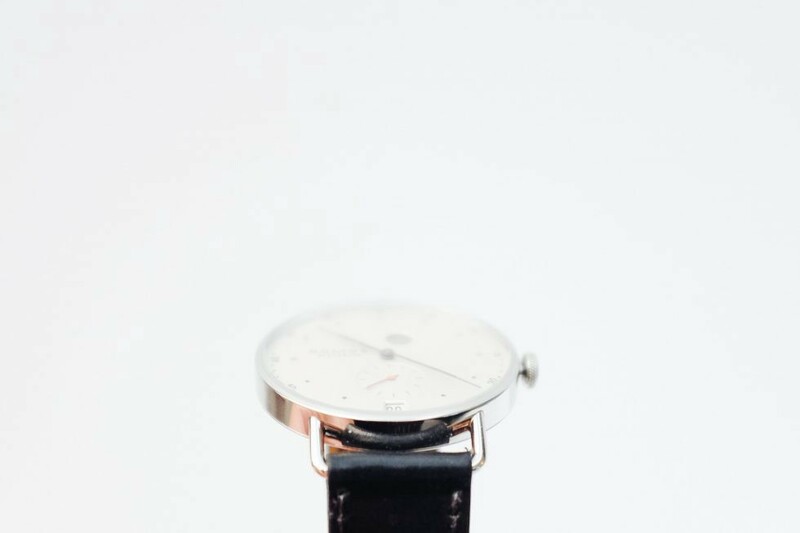 The watch is easy to read at a glance, and I like to addition of dots instead of lines on the dial. The second hand is located above the date near the bottom of the dial, neatly tucked out of the way. My absolute favorite thing about the watch is this thoughtful little battery indicator. Here you can see that the piece was wound up about halfway, indicated by half the red marking. It’s almost like a fuel gauge on a car. While hand winding the watch, you can see the indicator start to spin until the red is gone, showing that’s it’s fully wound. I should also mention that this movement will get about 42 hours of use on a full wind. 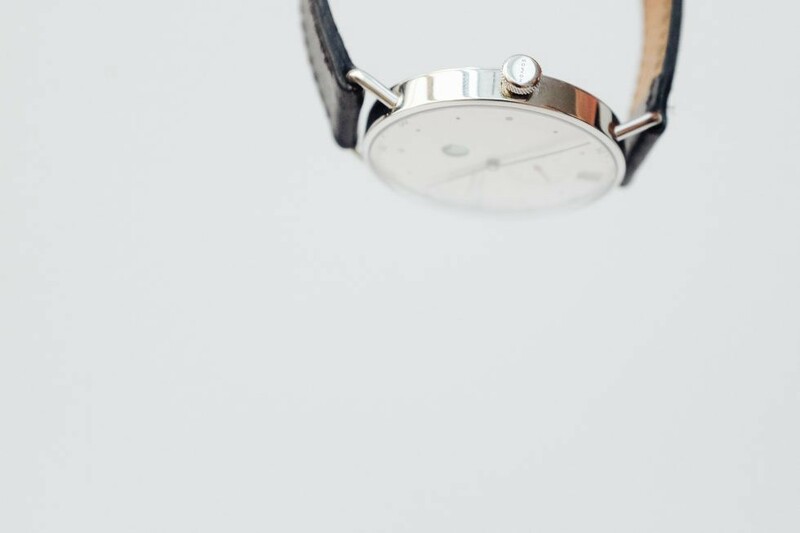 While there isn’t a traditional type of quickset for the date where you pull out the crown an extra click, it’s instead done by swinging the minute hand from the 12 o’clock position, to the 9. The lens is slightly domed near the edges, which helps give it more of a vintage vibe. 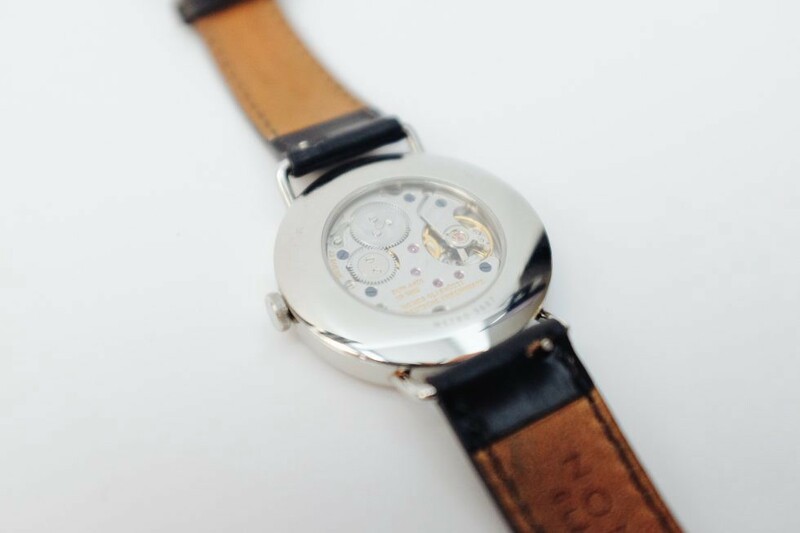 Looking through the lens at a sharp angle towards the edges will slightly distort the text below, which is an effect I enjoy on my other vintage watches. It is somewhat subtle though, you almost have to be looking out for it. The crown is a good size for the watch, and I like how it doesn’t have any crown guards. 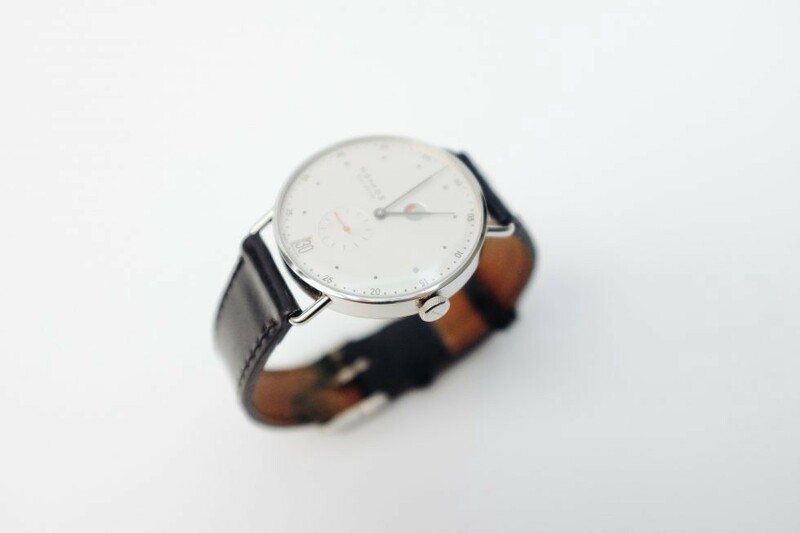 Here you can see a small NOMOS logo on the side. Another thing I noticed after wearing it outside, was the face appears to fade between a white and a light champagne color depending on the angle you look at it. Overall, I’ve really enjoyed this watch over the last few weeks. 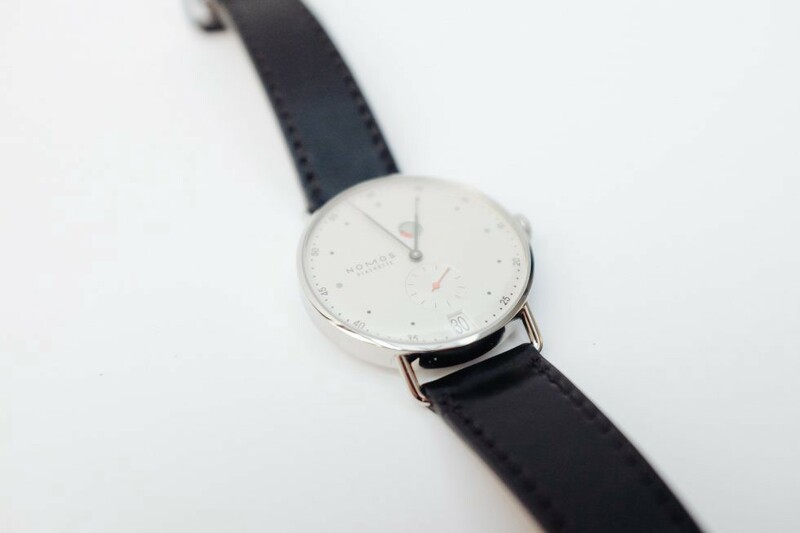 NOMOS is doing some exciting things in the industry, and their design aesthetic has always impressed me. 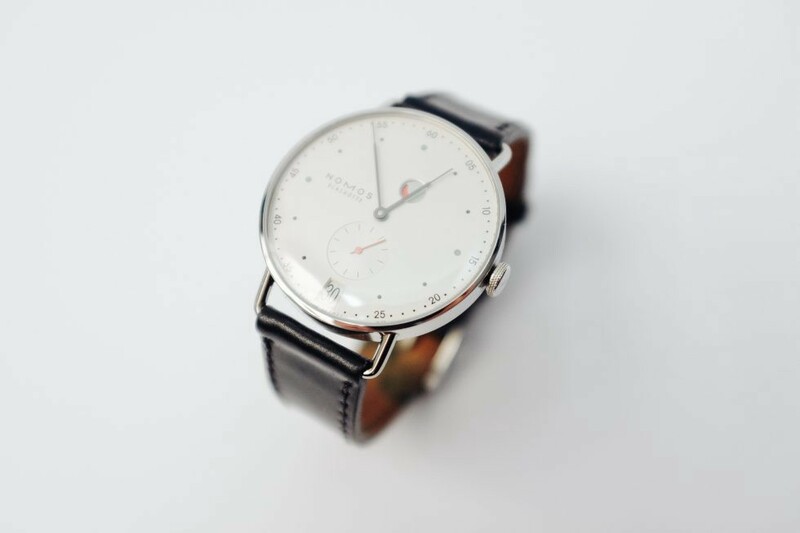 If I were looking for a manual wind dress watch that stood out from the crowd, the NOMOs Metro would be a strong contender. If you’re looking for something on the cheaper side of things, but still want a simple design check out my review of the Braun BN00032 and Braun BN0171.